You might have heard about a little film called Blackfish, a documentary which purported to expose SeaWorld’s animal abuses (we say “purported” because, well, there’s a lot of challenges to the film’s accuracy – which, no, we’re not going to get into here). In the two years since then, SeaWorld has paid the price for the controversial movie; its attendance at all three of its branded parks has shrunk, its stocks have collapsed, and it’s been scrambling ever since to get out ahead of the bad PR train and reassemble its identity, solvability, and – not to point too fine a point on it – its very existence. The first, somewhat halting step to this possible turnaround came in the form of the Blue World Project, which SeaWorld announced in August of 2014 and which would convert the various orca whales’ traditional tanks into a recreation of a natural habit; among its changes would be to make the holding areas 50 feet deep (and hold some five million gallons of water), include currents for exercise and play, and feature a “wildlife look.” The project would have started at the San Diego park this year before eventually making its way over to Orlando, which was supposed to have been completed in 2018. An investors’ call this past Monday seems to have derailed these plans, at least in part and at least for San Diego, which is currently in the midst of some possible regulatory actions by California’s legislature. And even if Blue World proceeds undisrupted at the other two locations, SeaWorld still had much to announce for them, ranging from new attractions and shows to some new investments in real estate, technology, and Christmas Claymation movies (seriously). All of this amounts to nothing less than a complete makeover for the biggest operator of theme parks in the country. Will it work? We don’t know… but it’s extremely intriguing to consider the four basic steps that SeaWorld is attempting to undertake. #1 – The end of Shamu shows? 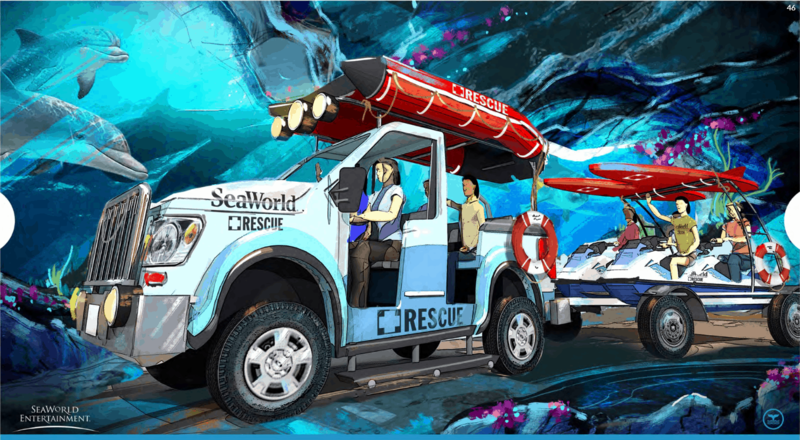 SeaWorld has a new “rescue and care” mission that it’s strictly adhering to from here on out. Okay, well, the message itself isn’t new, but the singular, unflinching emphasis on it is – every last facet of the parks, from its attractions to its seasonal events to its employees’ name tags, will reflect this core mission statement. Nowhere is this clearer than the flagship experience at any SeaWorld park, the Shamu show. The biggest headline out of the investors’ call was the removal of the current show, “One Ocean” (which has been performing at all three SeaWorld parks since 2011), from the San Diego location next year, with 2017 starting a brand-new experience that would rely less on theatrical elements and more on the orcas’ natural behaviors – along with conservation, but of course. There are a couple of important elements to note in this announcement. 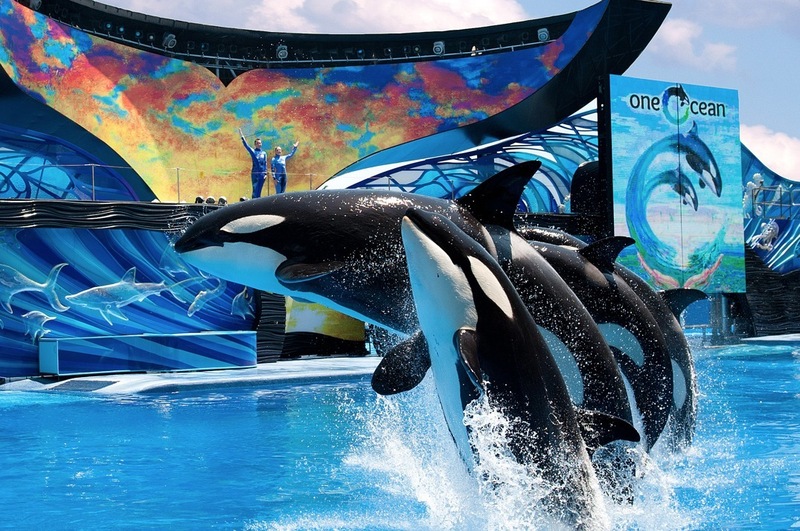 First and foremost, “One Ocean” will continue to run at both Orlando and San Antonio for the foreseeable future; San Diego is having it removed due to guest feedback there stating that they no longer wish to see the killer whales presented in a dramatic, artificial fashion. 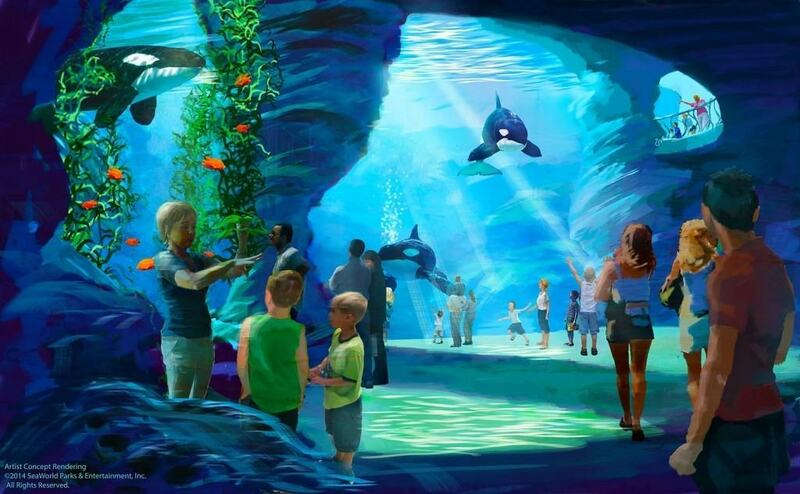 Secondly, it looks as if the huge chunk of change that was initially put aside for the Blue World Project there will be at least partially rerouted to pay for this new, more natural Shamu showing. Finally, the ongoing effort to introduce legislation in California that would ban captured wildlife from breeding – which was particularly aimed at SeaWorld’s killer whales – has also played at least a small role in the company decision, as it’s said that it didn’t want to devote millions of dollars to a new habitat that might shortly be rendered illegal. Is this a new trend that will eventually sweep up the other two parks? Though not definitive, the writing seems to be on the wall – with animal activism a new internal priority as well as an external one, it seems only a matter of time before Texas and Florida are forced to play catch-up. If so, it’ll be interesting to see what comes of the massive amounts of Blue World money and construction. The ultimate test of whether the traditional “One Ocean”-esque shows will finally come to an end will be next year, which is when SeaWorld Orlando is scheduled to start work on the new orca habitats. If construction never starts, we’ll know for certain which way the theatrical wind is blowing. In case the new conservation-heavy Shamu experience(s) just isn’t enough to drive the point home, SeaWorld also has a few new rides up its sleeve that it wants to share with you. 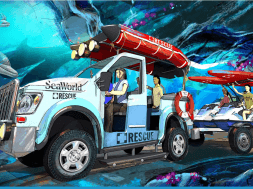 Its popular Sea Rescue Saturday morning show – which features various sea life being rescued, rehabilitated, and returned to the wild – will serve as the basis for these new experiences, which will include dark rides for Orlando and San Diego and a roller coaster for San Antonio. Although there’s been no official details announced as of yet, there has been concept art revealed, which shows jet skis serving as the cars for the coaster and kids sitting in trucks or submarines moving past underwater habitats for the dark rides. SeaWorld: Rescue Ride roller coaster. The move is an interesting one for the company, as it represents a brand-new pivot for its corporate identity and strategy both – before, its shows were considered to be its “x-factor,” but now that focus is being transitioned to rides. When combined with the previously announced Mako – Orlando’s tallest, longest, and fastest roller coaster – the new portfolio of rides shows a concerted effort to diversify its attraction portfolio as well as double-down on the “rescue and care” mantra. 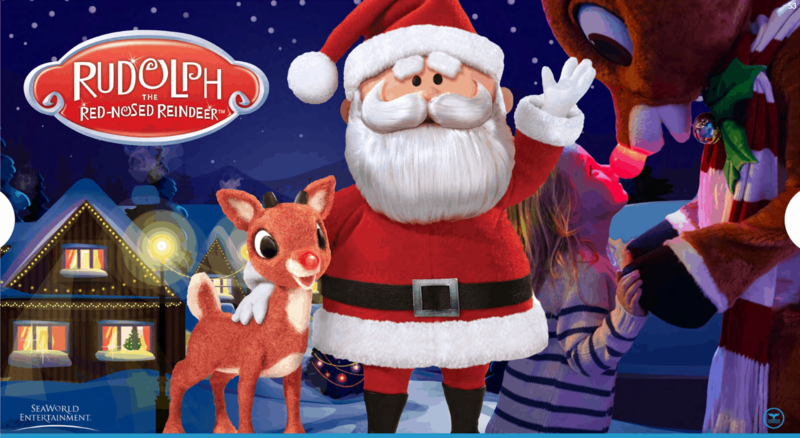 But perhaps the most intriguing – not to mention surprising – attraction announcement to come out of the investors’ presentation was the revelation that SeaWorld Parks and Entertainment has secured the theme park rights to the classic Rudolph the Red-Nosed Reindeer, which was, of course, a 1964 Claymation special produced by Rankin and Bass. Say hello to Rudolph and Santa! Since the park’s Christmas celebrations are already considered to be SeaWorld’s hallmark – and one of the highest-rated holiday events in the crowded Orlando theme park market – this move is obviously meant to further strength what is already a strength. 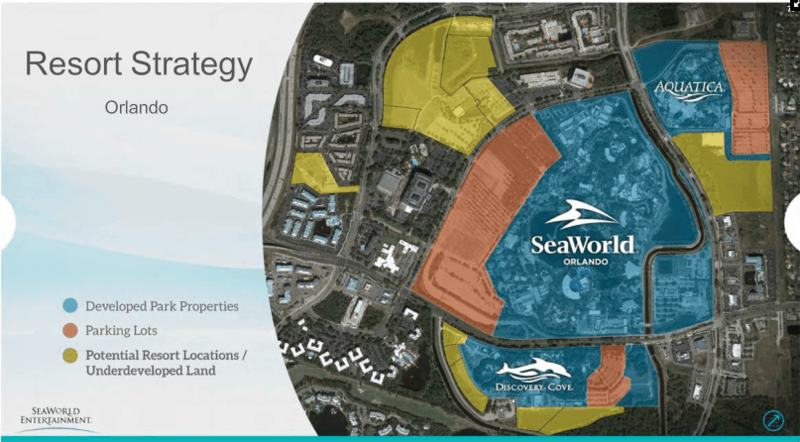 The final two notable changes revealed at Monday’s presentation aren’t nearly as big or as dramatic as the first two, but they’re still intriguing glimpses into a brand-new era for SeaWorld, particularly here in Orlando. 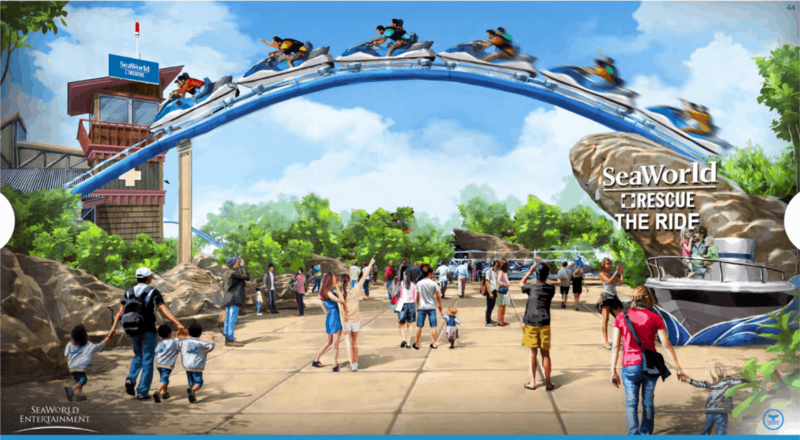 More than increasing its lineup of attractions or retooling (one of) its Shamu shows, the company is also looking to fundamentally expand its theme park presence by expanding from a simple park to a (more) all-encompassing resort. Think what Universal managed to do, transforming Universal Studios Florida to Universal Orlando Resort, albeit on a slightly smaller scale: all three SeaWorld parks are looking to get bigger footprints (and parking lots) and to either acquire or build from scratch branded hotels. The once and future SeaWorld Orlando Resort. This will be in addition to the water park, Aquatica, that already corresponds to each of the three locations, which will make them all come into closer step with the more developed resorts operated by both Disney and Universal in California and Florida. This is especially true in Orlando’s case – it’s the only SeaWorld to have a second theme park, as well, which is the highly-regarded Discovery Cove. All that’s missing now is a CityWalk/Disney Springs-esque area, an addition which seems to be a no-brainer, should this current round of expansion prove to be successful. 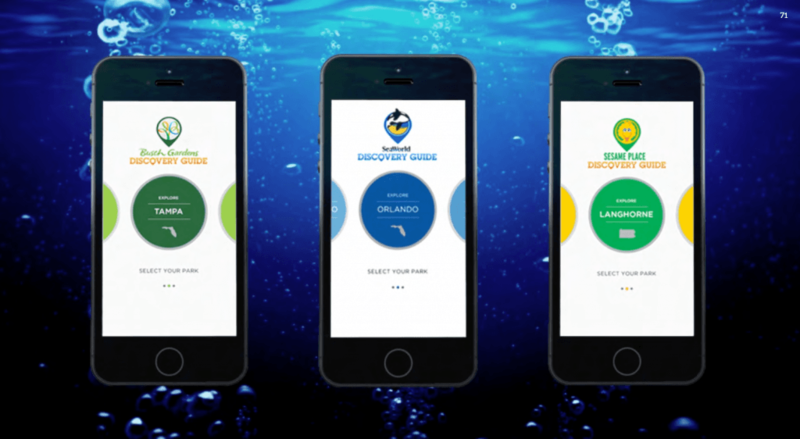 The final major item is the revelation that SeaWorld is in the midst of redesigning its online presence, making its website easier to navigate and streamlining its ticketing options. The result, the company hopes, will make it the polar opposite of Walt Disney World’s and Universal Orlando’s overwhelming array of options and prices, transforming SeaWorld’s smaller presence into a strength. Beyond this house cleaning, however, is a brand-new initiative that bears a striking similarity to Disney’s recent MyMagic+ program: guests will be able to plan out their entire visits and even make purchases from their smart phones and tablets well before stepping foot into the park. It seems as if the company will tie special benefits and time-sensitive offers into the program, encouraging guests to take to the advance planning. Finally, to pay for all of this infrastructure heavy-lifting – not to mention the new hotels, rides, and Shamu show(s) – SeaWorld Parks and Entertainment has announced an ambitious capital expenditure plan that will inject cash into the parks each and every year for the next five years, perhaps inspired by Comcast’s recent successes with its aggressive, $500-million-a-year investment in its two American Universal locations. Will this be enough to turn the tide? We can only wait and see. Can SeaWorld salvage its future? Sound off below in the comments.